On the corner of Merchant Road and Phayre Road, Rangoon. 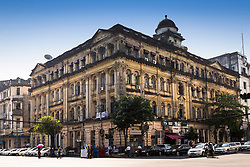 at the junction of the commercial and financial heart of Rangoon, this grand 1906 building housed the business interests of Issac Sofaer as well as others including the China Mutual Life Assurance Company. The ground floor corner premises were occupied by the Bank of Burma. Isaac Sofaer was a Baghdad-born, Rangoon-educated Jew who was a prominent member of Rangoon society. As well as owning many commercial properties in Rangoon, he was a member of the Municipal Committee, the Excise Committee and highly respected in the Jewish community. He was a successful trader in his own right with interests in wine and spirits, rice export and oil stores. Meyer Abraham Sofaer ran Sofaer & Co while his older brother Isaac, the creative genius, designed buildings. Meyer, whose father started the business, expanded Sofaer & Co's import, export and retail business, and made numerous trips abroad to secure import contracts. Isaac worked for him in that business, and left a legacy of several outstanding buildings that he designed in Rangoon, including the Sofaer & Co building with imported tiles from Manchester, now in the Japanese restaurant Gecko on the ground floor.